What I did was illegal, but the misty river was sublime. And so on the morning of October 14, 2016, I pulled off the side of Route 340 in Virginia, attached my Nikkor 70-200 f/2.8 lens to my D800, and took a hike along the insanely busy highway. I’d just crossed the Shenandoah River after spending the night in a Victorian home in Harpers Ferry W.Va. I was heading to the Potomac bridge below Harpers Ferry, where a pull-off is provided. But the Shenandoah was even lovelier with the sun starting to burn through the bank of fog that hugged the town. So I dodged the morning commute traffic, scrambled over the concrete barrier to the bridge, walked out over the river and began shooting, all the while wondering if my car would be towed or what kind of fine I would face if tagged. This was a labor of love. As a child I recall crossing the Shenandoah on this very bridge, my father driving, and being so impressed with river’s rugged beauty. It was nothing like the rivers back in Ohio, muddy, narrow and prosaic. Here was a river with rocks like fans, broad and dotted with islands and diverted for power. A river with a history, flowing through one of the most beautiful valleys in the East. 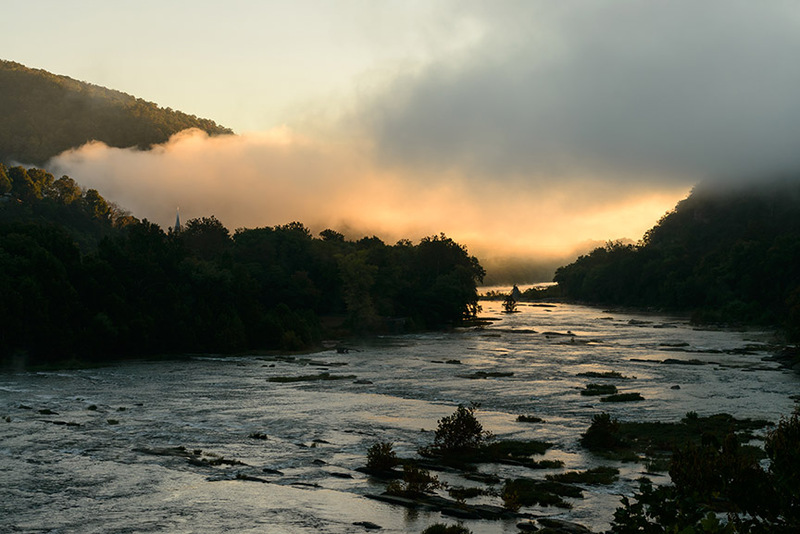 I returned to Harpers Ferry several times as an adult, but I never was happy with the images of this river that I captured. They never matched the magnificence of that memory from 50 years ago. This morning, however, was different. This morning was it. And I took the chance. I risked losing my car, a fine, embarrassment, even personal injury as I dashed through the traffic. Those are kinds of things you do for love. When you finally find that which measures up to your memory, you risk it all. And sometimes, some sublime moments, it is worth it all. I made it back to the car unscathed. About a quarter mile up the road, a Virginia State Police trooper was doing speed patrol. I am glad the officer was preoccupied and didn’t notice my illegally parked car. What we do for love, we do for beauty, we do for memory. And sometimes all we end up with is the memory.